My chapter is having major issues like talking trash, high tensions, brothers forming cliques and we even had a physical fight. I was wondering what steps should be taken to improve these issues? We are a small chapter of about 40 and only about 19 show up to everything. I am an engineer in my real life. As an engineer, we are often required to figure out why things aren’t working. To do that, we use what we call the ‘5 whys’. If you ask why 5 times, you often will get to the root of the problem. And that is what you are after – you need to figure out the root cause of these issues. 1st Why – Why aren’t you coming around? — I am too busy. 2nd Why – Why are you too busy? — I don’t have enough time to study. 3rd Why – Why don’t you have time to study? — I have a job where I’m working 20 hours a week. 4th Why – Why do you have a job? — I can’t make ends meet without one. 5th Why – Why can’t you make ends meet? — I have to pay my fraternity dues which kills my budget. So in my above example – you could be thinking the guy is a deadbeat because he never comes around, but in actuality the reason he doesn’t come around is because he has to work to meet his financial commitment to the fraternity. Now that you have identified the real problem – you can work on solving it. 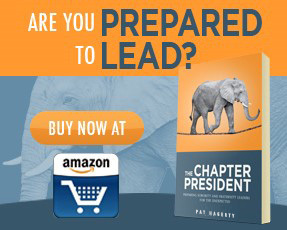 This is what you need to do to get your chapter out of the rut it is in. Identify the true problem, then work on solving it. I’m looking for a community service / volunteer opportunity that we can do in association with another sorority. Any ideas? As in, both our house and a sorority team up to participate in some kind of community service event? I know it’d be a great way to build relations with a sorority we don’t normally mix with but I’m just looking for some guidance on where to begin. We are looking for something that both my brother’s and the sorority would enjoy doing. I am a big believer in giving back to the community. If you find yourself on a college campus and in a fraternity, you are more fortunate than most in this world. As such, I feel you have the obligation to give to those who are less fortunate. I applaud you for having the same mindset. Sororities and fraternities are social organizations. As such, the easiest answer is to do something social. Some great examples are a casino night fundraiser, a date auction or charity concert. Think about throwing a great party, then think about how you can turn it into a fundraiser to give to a good cause. Another way to go is to assist local organizations in your area that need assistance. Women’s shelters, Habitat for Humanity and the Ronald McDonald house are all great organizations that do a lot of good for people. Call them up and ask how you can help. Another great idea is to call a local senior citizen home and offer to host an event. They will be able to give you a lot of great ideas and will really appreciate your time. Really, there are an endless number of rewarding possibilities for you and the sorority to choose from. My fraternity started in 1928 at this college, and was really huge fraternity until a few years ago. As of now, the fraternity is nothing. The college student body does not even know who we are. I want to change that. The only problem, however, I am a freshman who knows nothing about Greek Life. The only thing I know is I will be president next year. I want to turn this fraternity into something huge. How can I turn this fraternity into something huge on campus? Where do I start? What do I do? You have a big challenge – and I fear without direction you are going to go about it the wrong way. First off – you are going to be president next year and know nothing. That is scary as hell for you and your chapter. You cannot lead unless you have the knowledge to do so. You need to be on a mission to learn as much as possible about everything fraternity. My site is a good start. There are other great resources out there. Be sure to read my books – they are specifically written with a person like you in mind. Also, find people to mentor you. Go talk to your Greek Life director. Call your national headquarters. Talk to older brothers. Talk to brothers from other chapters. Talk to your chapter advisor. These people are a wealth of knowledge which is exactly what you need. This knowledge will at least give you a fighting chance. Then, focus on figuring out what your chapter is about. You do this by figuring out what your brothers want out of fraternity. Your job is to help guide their vision, not force your vision on them. Some great advice for someone in your situation is to do fewer things, but do them very well. Minimize programming but make what you do first class. This will instill pride in your chapter and create a good foundation to do bigger and better things. As your fraternity gets stronger, you will get known. I really wouldn’t worry about that now. You need to worry about taking care of your brothers first. If you improve how they feel about the chapter; others will realize it and your name will start to grow on campus.